I recently found a 90 day challenge for bloggers by Creative Bioscience. If you’re a food blogger, you can sign up to be considered for the challenge as well by going here. Anyway, basically it’s a 90 day challenge to whether lose weight or get fit. Personally, I have about 10 lbs that I want to lose and hope to lose this with the help of Creative Bioscience as a supplement to the Best Body Bootcamp I am doing for the next 2 months. The product I am choosing for this challenge from their wide selection is the Raspberry Ketone Plus. 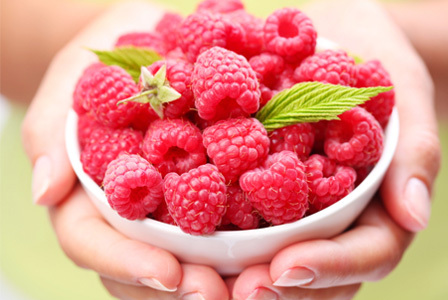 The info they have on the raspberry ketone on the website says that: “Natural diet supplements such as Raspberry Ketone 1234 are designed to help block fat formation as part of an ongoing lifestyle change that includes sensible eating and activity. There is no substitute for proper diet and exercise, but on the path to fitness it’s okay to get a little help along the way from the best Mother Nature has to offer.” However, by choosing the Plus variety, the product will be stimulant-free which is perfect for me as I am sensitive to caffeine and other stimulants. While I’m not usually big on diet pills at all – I’ve used my fair share of products to no avail – I feel like this one is the safest of them all; it has had a lot of background information and Dr.Oz even talked about it on his show. I feel like since this product is stimulant-free also, there shouldn’t be much side effects going on and should therefore be good to take for someone like me. 🙂 We’ll see how it goes! Of course, I will follow this with a great workout plan (Tina’s bootcamp) and healthy eating. Back in High School, I’ve seen the craze for Jodi Picoult come and go. Well, I didn’t actually see it go, but I did see it come. The book covers always looked so sappy and girly – I thought they were just typical chick books and I didn’t wanna jump on the bandwagon. So now, 4 years later, I finally picked up a Jodi Picoult book. And yes, I can see why everyone was so into her novels. Jodi Picoult writes about very sensitive issues – controversial, touching, heart-gripping stories, that although they feel and sound too wild to be true, they really and truly feel like they are genuine and real. She writes of things that could happen and she describes them with such much knowledge that throughout the whole book, I kept thinking this was a non-fiction. It was just so realistic. So well written. I have to admit, it took me a while to get used to her style of writing. I wasn’t used to the author jumping around so much from character to character. It was exhausting at first because there were just so many perspectives about the whole story, it could get slightly confusing. After about a quarter of my way through, I managed to learn to adapt to her style and enjoyed the book throughout afterwards. It is an incredibly complex story and the ending is extremely surprising – I had no idea it would end like that. Not even a slightest clue. It was shocking, heart-breaking, but also satisfying. It’s weird because when I first started reading, every time I saw the news on TV without the sound on (like in the gym) and a mug shot of a young boy would come on, I would think “oh this must be the kid who got arrested” but then I remember, wait, this didn’t actually happen – this story is fictional. Although things like it have happened before – think Columbine and many other schools. Anyway, it’s a fantastic read and I’ll be sure to read more of Jodi’s works. Disclaimer: I was provided the Raspberry Ketones to me free of charge for review. All opinions are my own. Awesome! 🙂 Welcome to a fellow raspberry ketone challenger! 🙂 What other books are amazing by her, that you can recommend for me to read? I loved that book!! It was so sad though, I must have cried at least 3 times throughout it ha ha. She is an amazing writer.